Pipe Shoes For 14" Pipe At A LNG Plant | Piping Technology & Products, Inc. Piping Technology & Products, Inc. fabricated cryogenic pipe supports designed for a 14-inch pipe at a LNG plant in Algeria. 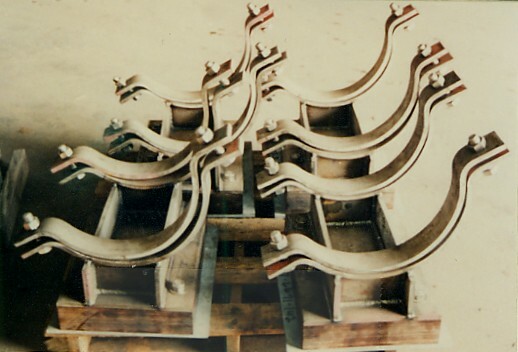 The pipe operates below minus 50 degrees F, therefore the pipe supports were fabricated from three different materials in order to accommodate the low temperatures. The upper part, which clamps on to the pipe, was fabricated from a stainless steel plate that retains its strength at low temperatures. The middle section is a laminated phenolic block made from layers of wood impregnated under vacuum with a synthetic resin. A crossed orientation of the hard wood fibers is used to provide extra strength. The laminated phenolic block, which is a poor conductor of heat, was bolted to the bottom plate of the galvanized carbon steel. Are you in need of some cryogenic pipe supports for an upcoming project? Get pricing today!